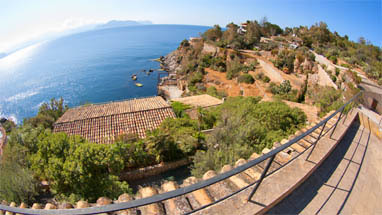 Are you looking for holiday lettings in Sicily ... ? ... but can't see the wood for the trees? We're not surprised, because the range of choices competing online is pretty confusing. To make it simple, we present a small selection of quality holiday rentals, each one chosen for an unusual feature to make your holiday in Sicily extra special. This may be a vast roof terrace all to yourself for sunbathing, a patio for dining outside with a panoramic view, direct access to a private beach, or an Italian language school or other special amenities right on your doorstep. Every agency wants to advertise their properties as being "close to the beach", but many of our properties actually have a private beach as their back garden. Some are for your exclusive use, and some are shared with the immediate neighbours. A few have sandy beaches, whilst others have wooden decking where you can sunbathe or dive straight into the water... and never a German beach towel in sight! They can all be reached directly from your back door. This luxury is not easy to find in Sicily, so there are not very many of these highly sought-after properties in our selection. Most of our holiday lettings are close to the sea, even those without their own beach. These come with different "extras" which you cannot find on a private beach: pleasure boat trips, sailing excursions, diving or other water sports. Not all visitors to Sicily want a beach holiday. Some prefer sightseeing, shopping and mingling with the locals on a city break. The problem on these holidays can be the non-stop noise. This can be a particular challenge if you insist on being a five-minute walk from the trendy bars in the main square, the private marina, the railway station and the cathedral as well! Your best option for a city break might be to choose a holiday letting near the railway of a smaller town, close to a big city. 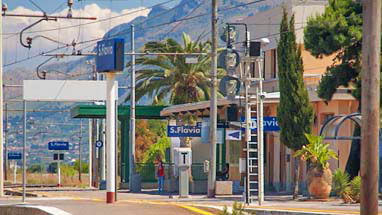 You can reach central Palermo by train in just 10 or 20 minutes from many small, lively satellite towns. With this solution, you could enjoy easy access to all the nearest cities and a chance to get away from the noise and pollution for a peaceful night's sleep, or a day at the beach if you fancy a change. A hire car is the most flexible option for a holiday in Sicily. The Sicilian traffic is not so scary once you get used to the Sicilians' rather wild driving style! Yet there are still some good reasons to take a holiday in Sicily without a rental car. If you want to get around without a rental car, you need to choose the location of your holiday apartment very carefully: you will need a Trenitalia railway station no more than a few minutes away. Another convenience to look for is being close to a big city, where the number of rail connections is vast. This is especially true of Palermo, where the central station is the island's biggest railway hub. Coaches to all destinations depart from the new central bus station beside it. 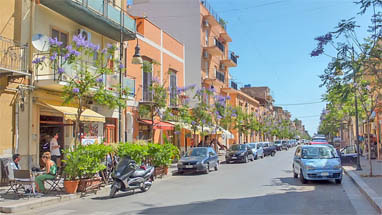 In addition, Palermo itself offers an enormous cultural diversity and many tourist attractions that can be explored on foot. In Sicily, the sun shines in January for a daily average of 4 to 5 hours. Compare this with Jersey, where the annual daily average is 2.75 hours! Sicily is great for a winter holiday, but also ideal to spend the entire winter if you can afford it. Since few northern Europeans have cottoned on to this idea yet, you have all the attractions of the island almost to yourself in winter. Choosing the right apartment is especially important in winter. Your holiday letting should be close to the sea but not directly facing it, as this may expose you to chilling damp winds. It should also have decent heating – which is woefully lacking in most Sicilian homes as well as holiday lettings. You should look for air conditioning with a powerful warm-air setting. If you prefer a more rustic look, choose an apartment or villa with a fireplace. 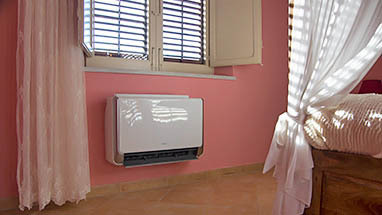 Apartments with good heaters and large windows are quite rare in Sicily and much sought-after, even in the winter low season.